Bushwick Inlet Park – Someday. 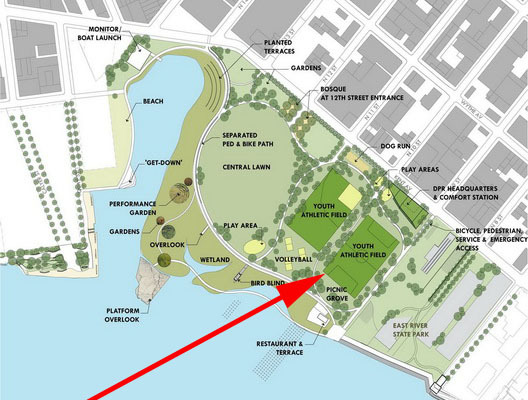 Curbed has a post today headlined “Long-Delayed Bushwick Inlet Park Now Planning for 2012“. What they mean is that the big pile of dirt on Kent Avenue between North 9th and North 10th Streets will become the headquarters for North Brooklyn’s Parks operations will open in “winter 2012”. Curbed mistakenly says that the “original plan, when the first phase of park construction kicked off back in 2009 after several delays, was for the whole 28-acre project to be done this summer”. Actually, the plan was only to have this little building completed by this summer. But even that is not going to happen. So this seems like a good time to check in on the status of Bushwick Inlet “Park”. You might remember that it was the major open space concession in the 2005 rezoning of Greenpoint and Williamsburg – a 28-acre waterfront park for two neighborhoods that historically ranked near the bottom in terms of open space. Bushwick Inlet Park represents over three-quarters of the new park space promised under the 2005 rezoning. That rezoning passed six years ago this month. Hundreds of new apartments have been constructed on the waterfront at the Edge and Northside Piers. Thousands of new apartments have been constructed on sites inland from the waterfront. So how is this jewel of the North Brooklyn waterfront coming along? We have a soccer field. It’s a very nice soccer field, but it is not a 28-acre soccer field. There is a big pile of dirt where the Parks headquarters will someday be, and that project is actively under construction. Of course that headquarters was supposed to “be” this summer. Instead, it is now “on schedule” for completion in winter 2012. In other words, it is about a year and a half behind schedule. Someday, that soccer field will look out on a waterfront esplanade, a restaurant and a pier-like structure. But right now it looks out on a chain link fence, and the esplanade is but a promise. That’s the parcel between North 9th and North 10th Streets, which accounts for about 15% (4.1 acres) of the promised park. There is less progress on the other 24 acres. To start with, the City doesn’t own most of that land – all they’ve managed to acquire is the 1.9-acre former Sanitation lot on Kent between North 11th and North 12th. The CitiStorage site (6.8 acres between North 10th and North 12th), the Bayside Fuel Oil site (7.3 acres between North 12th and North 14th) and the Motiva site (2.4 acres along Quay Street) are still privately owned. * Even if they were acquired today, it would take the City many years and many millions of dollars to clean them up and turn them into a park. Yes, times are tough and the budgets are tight. But the 2005 rezoning did come with an explicit promise – the private sector would build a lot of apartments, and the City would build some parks and open space. The private sector has kept up its end of the bargain – according to the US Census, about 2,200 people were added to the census tracts covered by the rezoning area between 2000 and 2010 (and many more units have come online in the last year). The City has not kept up its end of the bargain – having turned only 3.1 acres of Bushwick Inlet Park into actual, usable parkland. *If you’re doing the math, all that only adds up to 22.5 acres. There is an additional 5.5 acres or so taken up by the streets between these various lots. Presumably they are City-owned, but they aren’t park either. The East River State Park, between North 7th and North 9th, is another 6 acres or so, but is not included in these numbers.